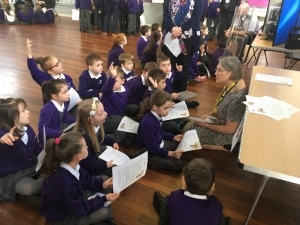 During National Careers Week, Education and Employers worked with a collection of Corby Primary schools to deliver a fun packed week of activities aimed at raising both aspiration and awareness of careers. Four primary schools from the Greenwood Academies Trust took part. The week followed the successful Career Footsteps event at Kingswood Academy in Corby, one of the trust’s secondary schools. The charity and trust selected Corby as an area to target, as the Social Mobility Commission ranked Corby as the fourth worst area for social mobility. 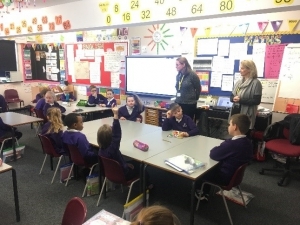 Under the Primary Futures programme, the charity delivered a series of tailored activities for each of the four primary schools. 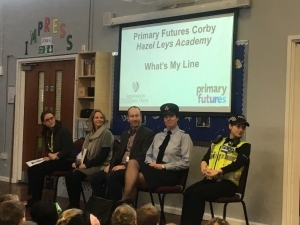 The week began with Hazel Leys Academy hosting the first of a series of What’s My Line activities across the four primary schools. The activity involved several volunteers taking part in an assembly format Q&A session, where the children tried to guess their professions through yes or no based questions. This was then followed by a reveal, where volunteers left and came back in uniform or with props that relate to their job. They then proceeded to introduce themselves and their respective careers to the children. In support of the What’s My Line activities, volunteers were asked to deliver breakout sessions, so they could expand more on their careers and answer any follow up questions that the children may have. Each school chose to involve the whole school in the What’s My Line activities, while then targeting the breakout sessions at selected year groups. 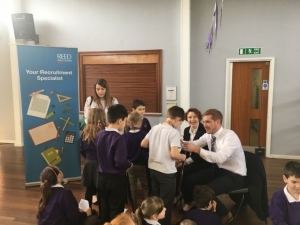 This format was repeated at each of the primary schools with Corby Primary Academy on the 6 March, Kingswood Primary Academy on the 7 March and Danesholme Junior Academy on the 8 March respectively. 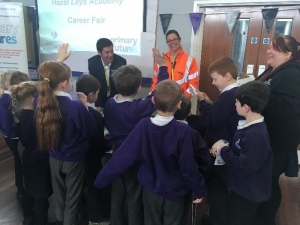 Friday the 9 March saw all four of the primary schools come together at Hazel Leys Academy where the week began. Each school put forward their full cohort of Year 3’s to take part in the activity. The day involved an activity that combined a Speed Networking and Careers Fair format. Volunteers each had their own information stand, which they filled with props and materials that would help them engage with the Year 3 children. The children were grouped into small groups and spent around 15 minutes at each stand, where they had the chance to ask the volunteers about their professions. To support the engagement, the volunteers were asked to spend the first three minutes introducing themselves. The day was split into two sessions, each lasting one hour and a half. The first session took place with 110 children from Kingswood Primary Academy and Danesholme Junior Academy. While the second session involved 90 children from Hazel Leys Academy and Corby Primary Academy. This day was also supported by the Edge Foundation, and was delivered under the Career Footstep Programme. The programme has been run in partnership for three years between the two charities; it aims to raise the awareness of vocational and alternative pathways into the world of work. This is achieved through working with schools to host bespoke events involving volunteers from the Inspiring the Future platform who hold a vocational qualification. In line with the aim of the programme several of the volunteers that took part had taken vocational qualifications. In total 31 volunteers took part in the aspirations week; from several different employers and sectors. Volunteers ranged from a Programme Manager for Network Rail, to a former Solicitor turned university lecturer. At least one representative from Northamptonshire Police attended on each of the days. 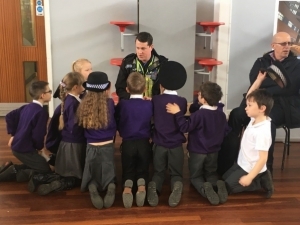 The children got to learn about different careers and gained an insight into the skills required for each job and the world of work. Overall the week saw almost 1000 primary aged children take part in at least one career engagement activity! The four primary schools now plan to make the week a fixture in the school calendar and have plans to look at rotating the final day at each of their respective schools. The week was a pilot for both the charity and Greenwood Academies Trust and future plans are in place to build on its success. The trust now plan to roll out similar week across their other clusters of schools.